So I was listening to this interview with James Grognardia Maliszewski (which is fun and has a great story about a 20-sided die) and it got me thinking when he said you have to "Let the dice play their part." It's a storytelling game, right? Everyone at the table is helping tell the story, everyone, depending on their character (if you're a player) or status (if a GM) contributes to the story in a different way because they all have slightly different roles--formally (rules-wise) and socially. You have to make these different inputs into a coherent whole. This is the whole set-up of an RPG (or even, in this case, a sport or wargame). So a way to imagine the role of system is to introduce the idea that the game itself (that is: ruleset + setting) is also a player. And the dice are its mouth. Like any player, its responses are an expression of what's in it, the aggregate of all the knowledge and opinion stored inside. The game designer has, in essence, programmed a (very) manually operated robot and you bought it and made it play with you. So what kind of player do we have here? A player whose feelings do not matter, but who we nevertheless all decided would be fun to play with on account of the quality of his/her ideas (setting) and personality (system) and who plays characters called Physics or Fate. This is a player who'll give you ideas when asked, but does not volunteer ideas unless asked by the GM or other players. So when we ignore the dice we are sort of ignoring this player's input ('railroading' it--to stretch the metaphor waaaaaaaay out). -One is the fallacy of saying the problem with railroading is just that it hurts players' feelings. -It shows one of the things you're really doing when you fudge--you're choosing to ignore someone that you yourself invited in. -It shows what you're doing when you're hacking--you're changing this robot player so it fits in better with the other people at the table. -It shows what the game designer's real job is--to package a personality to be exported to your table. This voice will be just one of five or six or seven or whatever at the table. -It shows what you're doing when you're complaining about a system--essentially its like saying "Don't play with that guy, he's a handful". -It also shows how subjective it is: some people can handle people that other people can't handle. Some people rub each other the wrong way and bring out all the bad bits in each other. -It suggests why we want a system at all, what we expect from it. Ha! I love that. I think I will remind my players of this at the start of each campaign/when we change systems. It makes A LOT of sense especially when put into that metaphor. Might even help me deal with PC deaths so I can still get attached to them but don't get all bent when a character drops since I can associate that the dice & the system are simply adding their input that WE asked to come to the game. No malice, no agenda, simply the input we asked for. Thanks Zak. now Imma go listen to that interview! That robot metaphor makes me think of Star Wars where the farmboy hero is the only that treats droids like people. I've actually ended up writing a bit about this in my attempts to explain to people why random tables are fun and why what seems like DM Fiat isn't nearly as simplistically authoritative as it might sound like at first. Since I don't feel like retyping it, I'll just c/p one of the relevant bits. "Final authority on what happens when a character tries to do something always has to fall on either the DM, the players, or the dice/rulebook (which in turn still needs to be interpreted by one of the other two). I don't see how giving it to the DM is inferior to either of the other two options, although I do think that techniques that temper that power are useful. Generally the way I enjoy most is when the player suggests an action, the DM/players put their heads together to get a general consensus on how workable that action is, and then the DM decides on how likely any given outcome is, rolls the dice, and interprets the 'actual' outcome based on those. It's still pretty much DM Fiat, but it's not exactly "heh, I'll allow it. . .this time". " I think that the role of dice and mechanics in the process of distributing authority over what goes on in the game world is really interesting, and thinking of them as another player physically sitting at the table actually makes a lot of what they do way easier to wrap your head around. I'm against pure DM Fiat for important decisions, since letting one person alone determine what happens makes it too easy to 'play the DM', but by making the decision part of a collaborative effort between the DM and the dice you end up with rulings that are way more fun to engage with than any single person could make on their own. This is also why I'm a little uncomfortable with systems that put too much emphasis on the authority of the literal rules--the rules alone are inflexible and uncreative, and they need collaboration with another participant to really be able to shine. So what are the personalities of different editions then? Is 1E the addled 'nam vet and 4E the fawning buttkisser? Is Ctulhu the creepy yet intelligent uncle? Please don't edition war in my comments. Mind = Blown. A very insightful post! "...some people can handle people that other people can't handle. Some people rub each other the wrong way and bring out all the bad bits in each other." I move between two different gaming groups (most of which know or at least know of each other) and there is one person in each group that is mutually exclusive and who both extremely dislikes the other one. Both groups also have different preferred play styles. One is d20/Pathfinder and the other prefers FATE and GUMSHOE. So really each group has *two* players that they can handle that the other group can't. Really sharp observations here, thanks!! Oops! No intended - I keep forgetting I'm not in a smoky uni dorm room with a bottle of vino and some peeps. But Cthulhu IS he creepy, ageless uncle. 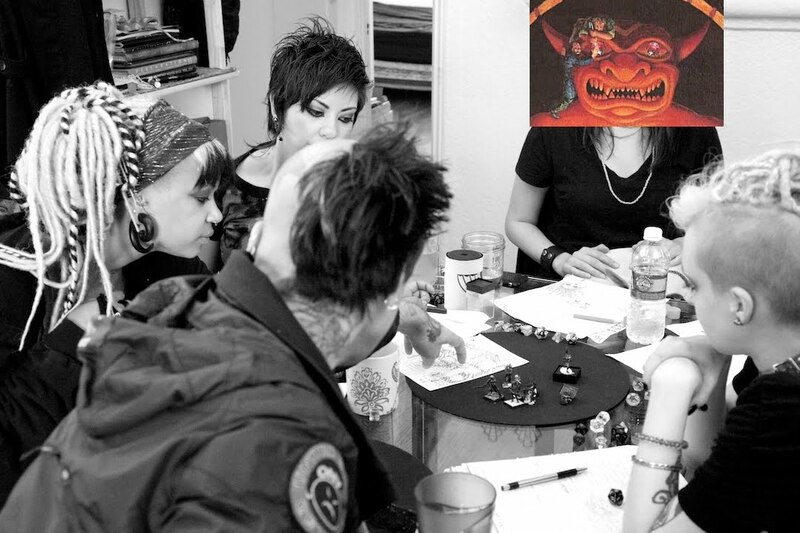 ...The challenge facing rpg designers is to create outcomes that every single person at the table would reject, yet are compelling enough that nobody actually does so. (***) If your game isn't doing that, like I say it's interchangeable with the most rudimentary functional game design, and probably not as fun as good freeform." This strikes me as a bit further than you would have wanted to go in your post, but I think that you're in broad agreement. I'm especially fond of the idea that good game design lies in ensuring the unwelcome but compelling-it's a downside of random tables, for instance, that they can easily produce the unwelcome but silly/dull/whatever, and at that point things can get very tough. Same deal with, say, results like a 100' fall producing 10 points of damage and the victim just dusting themselves off and going on. I usually find myself agreeing with any Vincent Baker statement that does not end with "...doesn't that sound cool?". Though I don't really understand your point about random tables--they always rock on a poppy seed bagel with extra raisins in any game I've experienced. W/r/t random tables, I think that the challenge becomes one of incorporation in a way that doesn't violate the group's standards for what makes sense in this world (or the ones that have a functional equivalent of "nothing happens" in 'em). What I'm saying is that tables produce a challenge to the integrity of the fiction quite often, and part of play is to quickly develop a vigorous incorporation of the results. That often rocks. IMO (& unfortunately E), tho, if the table bails on that particular challenge, it can be very bad. So, either the tables need to be aces top to bottom for everything in every circumstance, and everyone strongly engaged in making 'em work, or you'll occasionally get a genuine clunker of uncompelling unwelcomeness. That's a great angle to take. I think I've tried to unknowingly keep that concept in mind in our gaming. Regardless of the dice rolls or the treasure found, I let it ride. It's all unexpected and lets the DM/GM be surprised and challenged and participate more as a player as well instead of just being someone above it all to layout the situations. This post has been scratching at my brain since it went live. It's mixing around with my ideas on who the real storyteller is at the gaming table (PROTIP: it is not the DM/GM/Referee/Storyteller/whatever), and making me think about things that will inevitably end up in some kind of talky theory blahblahblah posting. Really nice post! The metaphor of "game system as additional player" never occurred to me before. For some reason is reminds me...and this is silly...of Steve Martin's 1st Pink Panther movie. There's a scene towards the end where everything has gone poorly, he's fired, and sitting down at his desk. "Hello, internet my old friend," he says, or something like that. Then with a click he manages to crash the power grid for all of Paris. DnD is kind of like that for me. "Hello DnD, my old friend." Wow! Great idea. Do you mind if I translate it to Russian and post in my blog? With all due credits and link to original of course.